This HDCCTV or TVI (High Definition Transport Video Interface) camera is equipped with a CMOS image sensor and has 1080P video image quality. The viewing angle is easy to modify via the motorized varifocal lens, which can be controlled from the DVR. This saves quite some installation time. 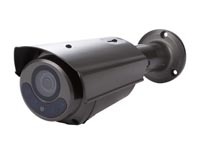 The housing is vandal proof, the camera features powerful night view up to 50 meters. The IR-cut filter will filter the IR light, so it cannot distort the colour image. When it gets dark, the camera automatically switches to night mode. In night mode, the camera enables the IR LEDs and disables the IR-cut filter. An OSD menu allows changing the camera settings. You can control this menu with an AV tech HDCCTV recorder.